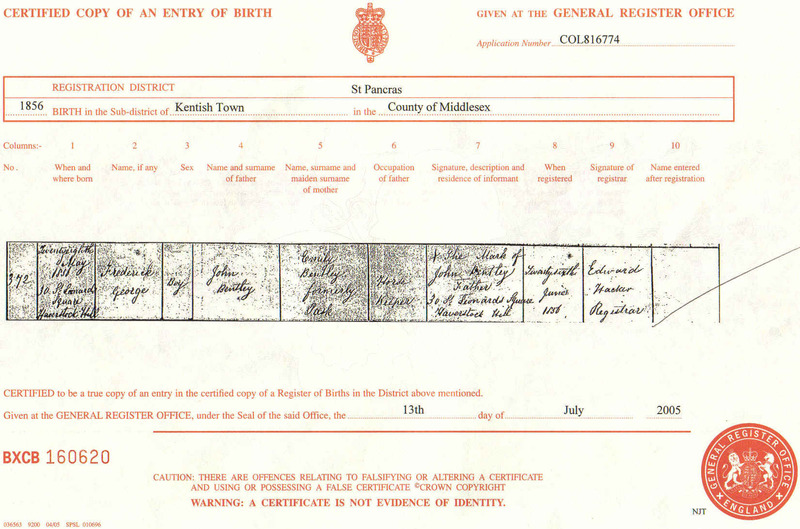 [S5000] Website Ancestry Family Trees: http://trees.ancestry.co.uk/pt/person.aspx : Gives the date of birth as 9 July 1871 in Laleston, Bridgend. The day may be correct, but the year is believed to be 1867. [S2] GRO Indexes to Births. "1867/Q4 PASK, Louisa Bridgend 11a 458." [S3] GRO Indexes to Marriages. "1887/Q2 PASK, Louisa Cardiff 11a 433." [S2951] Image of the 1891 Census for Cardiff, Glamorgan: RG12 Piece 4401 Folio 101 Page 22. [S2952] Image of the 1901 Census for 13 Parkfield Place, Cardiff, Glamorgan: RG13 Piece 4970 Folio 45 Page 15. [S4] GRO Indexes to Deaths. "1921/Q1 TYLER, Thomas W. Cardiff 11a 444 age 54." [S4] GRO Indexes to Deaths. "1924/Q1 TYLER, Louisa Cardiff 11a 507 age 55." [S417] Website Ancestry Civil Registration - Marriages: "1900/Q1 PASK, Herbert Worcester 6c 330 = Lucy KING." [S4] GRO Indexes to Deaths. "1932/Q4 PASK, Lucy Northampton 3b 38 aged 71." [S1346] Image of the 1901 Census for Worcester, Worcestershire: RG13 Piece 2777 Folio 173 Page 29. [S3] GRO Indexes to Marriages. "1900/Q1 PASK, Herbert Worcester 6c 330." [S4] GRO Indexes to Deaths. "1972/Q2 PASK, Marion Louise 1 DE 1899 Ilkeston 3a 872." [S1347] E-mail from Robyn Clarke to Stuart & Teresa Pask dated 3 July 2005. [S3] GRO Indexes to Marriages. "GRO Index Army Marriages 1916-1920 - PASK, Jack TRISTRAM Quetta 1917 99." [S1347] E-mail from Robyn Clarke to Stuart & Teresa Pask dated 10 July 2005. [S3520] Website Ancestry UK Incoming Passenger Lists, 1878-1960: Source Citation: Class: BT26; Piece: 875; Item: 127. [S3520] Website Ancestry UK Incoming Passenger Lists, 1878-1960: Source Citation: Class: BT26; Piece: 1123; Item: 11. [S4] GRO Indexes to Deaths. "1963/Q4 PASK, John Ilkeston 3a 339 age 79." [S1347] E-mail from Robyn Clarke to Stuart & Teresa Pask dated 19 June 2007. [S2] GRO Indexes to Births. "1920/Q2 PASK, Arnold TRISTRAM W Derby 8b 1363." [S252] Website Rootsweb: http://archiver.rootsweb.com/th/read/CORNISH/1999-03/… "RICHARD LANDER (b.1804 Truro d.1834) married HARRIET HUGHES 1828 St. Margaret's, Westminster. After his death she remarried, probably HUGH PASK, but when and where and her date of death ?" [S2136] Image of the 1861 Census for Julian Street, St. Julians, Norwich: RG9 Piece 1215 Folio 33 Page 26. Indexed incorrectly under the name of PARK. [S2132] Image of the 1871 Census for 3 Malden Crescent, St. Pancras, London: RG10 Piece 245 Folio 41 Page 14. [S2133] Image of the 1881 Census for 6 Crogsland Road, St. Pancras: RG11 Piece 214 Folio 34 Page 62. Research Note: Tracy wrote in July 2005 : "Frederick George Bentley had a large family all of whom I believe lived in Canada, but I haven't as yet been able to track down his marriage to Ada (nee ?) or a record of the births of his children - I'm inclined to believe that they were born in Canada but this may not be the case - they were Winnie, Cissie, Beth, Edie, Jennie and Walter - no particular order.9,2"
Walter Stanley b1900 Camberwell - no marriage information confirmed but have a photo of him in his 70's with his wife Marjorie - I believe they had children so there will be some Bentley named cousins in Ontario.2"
[S1280] E-mail from Tracy Bentley to Stuart & Teresa Pask dated 23 July 2006. [S1280] E-mail from Tracy Bentley to Stuart & Teresa Pask dated 14 March 2007. [S3] GRO Indexes to Marriages. "1886/Q4 BENTLEY, Walter Guildford 2a 128." [S3] GRO Indexes to Marriages. "1886/Q4 BLAKE, Jane Guildford 2a 128." [S1355] E-mail from Michael Pask to Stuart & Teresa Pask dated 15 July 2005: Family Bible. [S2] GRO Indexes to Births. "1887/Q1 COX, Lizzie N. Witchford 3b 568." [S4] GRO Indexes to Deaths. "1976/Q4 PASK, Lizzie 11 MR 1886 Ealing 12 0138." [S1355] E-mail from Michael Pask to Stuart & Teresa Pask dated 16 July 2005: Family Bible. [S1355] E-mail from Michael Pask to Stuart & Teresa Pask dated 19 July 2005. [S3] GRO Indexes to Marriages. "1907/Q4 PASK, Herbert Nathan Brentford 3a 205." [S417] Website Ancestry Civil Registration - Marriages: "1907/Q4 PASK, Herbert Nathan Brentford 3a 205 = Lizzie COX." 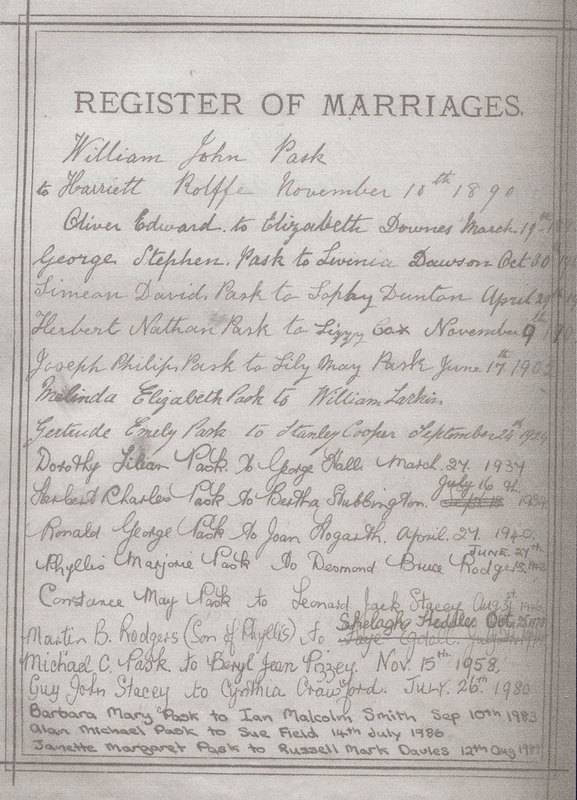 [S3230] An image of the "Register of Marriages", detailing the descendants of Philip & Rosetta Pask née Keen, kindly provided by Alan Michael Pask at the Pask Family Gathering on 26 July 2008. [S4] GRO Indexes to Deaths. "1960/Q2 PASK, Herbert N. Ealing 5e 27 age 75." 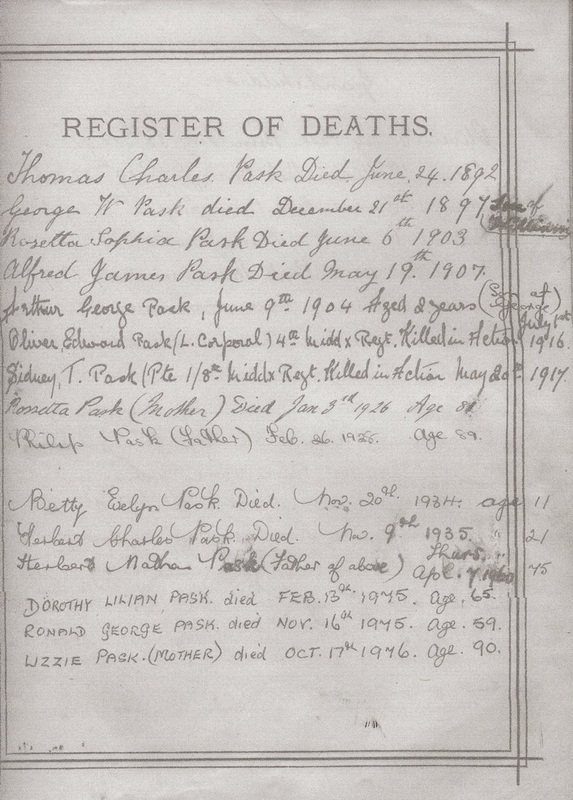 [S3231] An image of the "Register of Deaths", detailing the descendants of Philip & Rosetta Pask née Keen, kindly provided by Alan Michael Pask at the Pask Family Gathering on 26 July 2008. [S416] Website Ancestry Civil Registration - Deaths: 1879/Q2 RUSE, Rutland Risbridge 1d 117 age 42. [S3] GRO Indexes to Marriages. "1922/Q2 LARKINS, William PARK Hartismere 4a 2171." [S3] GRO Indexes to Marriages. "1922/Q2 PARK, Melinda E. LARKINS Hartismere 4a 2171." [S6] Teresa & Stuart Pask's Guesses, Theories and Speculations: No children identified in the GRO Birth Index with the name of LARKINS, with a mother's maiden name of PASK. [S3] GRO Indexes to Marriages. "1905/Q2 DUNTON, Sophie Eton 3a 1445." [S753] Image of the 1901 Census. Image available upon request. "RG13 Piece 1192 Folio 8 Page 8." [S415] Website Ancestry Civil Registration - Births: 1873/Q4 DUNTON, Sophia Eton 3a 467. [S3516] Image of the 1911 Census for 1 Ranelagh Mews, Ealing, Middlesex: Census 1911 RG14 Piece 6891 Schedule 12. [S3] GRO Indexes to Marriages. "1905/Q2 PASK, Simeon David Eton 3a 1445." [S4] GRO Indexes to Deaths. "1935/Q1 PASK, Simeon D. Eton 3a 1293 age 61." [S4] GRO Indexes to Deaths. "1950/Q3 PASK, Sophia Eton 6a 267 age 76." [S3] GRO Indexes to Marriages. "1924/Q3 COOPER, Stanley O. PASK Malling 2a 2079." [S3] GRO Indexes to Marriages. "1924/Q3 PASK, Gertrude E. COOPER Malling 2a 2079." [S2] GRO Indexes to Births. "1909/Q3 PASK, Dorothy Lilian Brentford 3a 132." [S4] GRO Indexes to Deaths. "1975/Q1 HALL, Dorothy Lilian 17 JY 1909 Hounslow 13 1347." 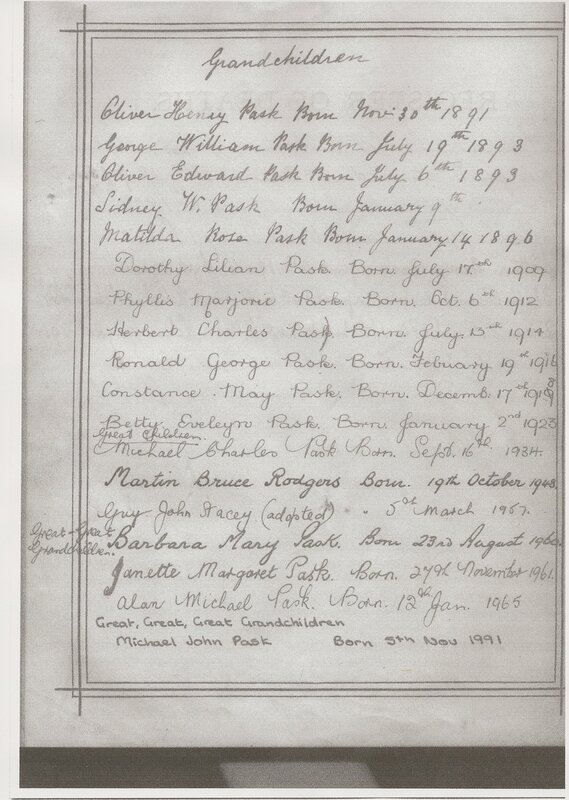 [S3232] An image of the "Register of Grandchildren", detailing the descendants of Philip & Rosetta Pask née Keen, kindly provided by Alan Michael Pask at the Pask Family Gathering on 26 July 2008. 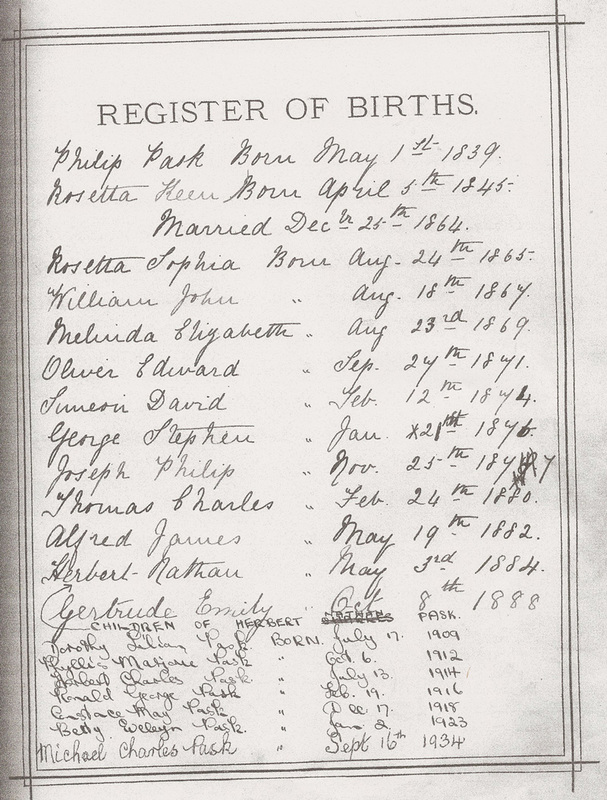 [S3233] An image of the "Register of Births", detailing the descendants of Philip & Rosetta Pask née Keen, kindly provided by Alan Michael Pask at the Pask Family Gathering on 26 July 2008. [S3] GRO Indexes to Marriages. "1937/Q1 PASK, Dorothy L. HALL Brentford 3a 328." [S3] GRO Indexes to Marriages. "1937/Q1 HALL, Walter G. PASK Brentford 3a 328." [S2] GRO Indexes to Births. "1912/Q4 PASK, Phyllis M. COX Brentford 3a 247." [S4] GRO Indexes to Deaths. "Name: Phyllis Marjorie Rodgers Death Year: 1995 Age: 83 Birth Date: 6 Oct 1912 Death Registration Month/Year: Jun 1995 Registration District: Wycombe Inferred County: Buckinghamshire Register Number: 22C Entry number: 97." [S3] GRO Indexes to Marriages. "1942/Q2 PASK, Phyllis M. RODGERS Brentford 3a 1002." [S3] GRO Indexes to Marriages. "1942/Q2 RODGERS, Desmond B. PASK Brentford 3a 1002." [S2] GRO Indexes to Births. "1914/Q3 PASK, Herbert C. COX Brentford 3a 318." [S3] GRO Indexes to Marriages. "1934/Q2 PASK, Herbert C. STUBBINGTON Brentford 3a 647." [S3] GRO Indexes to Marriages. "1934/Q2 STUBBINGTON, Bertha E. PASK Brentford 3a 647." [S4] GRO Indexes to Deaths. "1935/Q4 PASK, Herbert C. Brentford 3a 267 age 21." [S2] GRO Indexes to Births. "1915/Q4 STUBBINGTON, Bertha E. PASSEY Brentford 3a 260." [S3] GRO Indexes to Marriages. "1939/Q3 PASK, Bertha E. PEARCE Brentford 3a 1559." [S3] GRO Indexes to Marriages. "1939/Q3 PEARCE, Thomas PASK Brentford 3a 1559." [S4] GRO Indexes to Deaths. "1975/Q4 Ronald George 19 FE 1916 Ealing 12 0232." [S2] GRO Indexes to Births. "1916/Q1 PASK, Ronald G. COX Brentford 3a 297." [S3] GRO Indexes to Marriages. "1940/Q2 PASK, Ronald G. HOGARTH Uxbridge 3a 314." [S3] GRO Indexes to Marriages. "1940/Q2 HOGARTH, Joan PASK Uxbridge 3a 314." [S4999] Website UK Government Probate Search Service: PASK, Ronald George of 25 Knowsley Av Southall Middx died 16 November 1975 Administration London 21 June £15850 760155800U. [S2] GRO Indexes to Births. "1918/Q4 PASK, Constance M. COX Brentford 3a 244." [S3] GRO Indexes to Marriages. "1946/Q3 STACEY, Leonard J. PARK Brentford 5e 93." [S3] GRO Indexes to Marriages. "1946/Q3 PARK, Constance M. STACEY Brentford 5e 93." [S1355] E-mail from Michael Pask to Stuart & Teresa Pask dated 30 December 2011. [S2] GRO Indexes to Births. "1923/Q1 PASK, Betty E. COX Brentford 3a 246." [S4] GRO Indexes to Deaths. "1934/Q4 PASK, Betty E. Brentford 3a 243 age 11."